On Wednesday, Page 2 ran its list of the best coaches of all-time. We asked for your take, and you filled our mailbag with plenty of opinions. There can be no other choice but John Wooden. While his 10 championships speak for themselves, what says more about Wooden than any other fact is his admitted absence of "coaching" during a game. He always had his teams prepared well ahead of time. Unlike today, where players call timeouts they don't have, Wooden's players were so grounded in the fundamentals that not only would such an error be inconceivable, but it did not even need to be mentioned in the huddle! Add to all of that the fact that was, and always will remain, one of the true gentlemen in sports, or any other walk of life. The term "legend" is so casually tossed around in sports today. It does not even come close to describing John Wooden. Page 2's readers and editors agree: John Wooden is the best coach ever. I'm from Nebraska, so you are expecting Tom Osborne, right? Well, I put him second. John Wooden has to be the top coach of all time. He not only got his teams to win, he kept them from being complacent. He taught them how to be good people and good sports and still be competitive. He got stars to play unselfishly together. From the interviews I have read, he could still coach the game today. Could he still work with the egos involved? My guess is he would recruit based on character and still make the Sweet 16 every year. Joe Paterno is the greatest coach of all-time not only because he will soon hold the Division I all-time win record, but because of his dedication to making his players work as hard in the classroom as they do on the field. Among the traditional football powers, most cannot claim a 75 percent graduation rate and I think Coach Paterno takes as much or even more pride in those numbers than the ones his teams put up on the field. He produces people who can become productive members of society in whatever field they choose. Joe Paterno gets praise for his record on and off the field. If Courtney Brown hadn't become a professional football player, he would have been successful in his chosen field of integrative arts where he had a near perfect GPA. In fact, two days after being chosen No. 1 overall and signing a huge contract, Brown was back in class. That kind of dedication is expected from everyone who plays for Paterno. 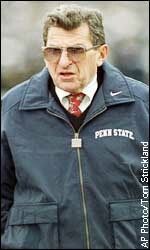 Paterno is the epitome of class, produces true student-athletes and wins on a consistent basis. If he's not the greatest coach ever, I don't know who is. 2.) In this day of big bucks, Paterno stresses MBA over NFL. He is totally focused on academics and recruits intelligent players who have the same focus, unlike some other programs. 3.) He has impeccable integrity. Sure, PSU has problems, but Paterno is a guiding force of morality. He removed Enis for the suit problem, compare that to Warrick's situation. He pulls his top receiver for getting a B- in class -- who else would do that? He took so many cheap shots for the Casey situation last year -- and look at that, he was right! 4.) Everything that is good about football points to Paterno. He has outlasted more than 600 DI coaching changes during his tenure at PSU. He is versatile. Sure he is coming off a losing season, his second ever! Look at Walt Harris, three out of four seasons were losing ones -- and he is called a 'genius'! What does that make Paterno? Paterno has the awards, reputation, integrity, priorities and class to be named the No. 1 coach. He is a diamond in the proverbial coal mine of sports. Let's show everyone what is right with sports and put Paterno No. 1. Show America you can be a winner on an off the field with integrity, honesty and class! Paterno is just that! North Carolina legend Dean Smith was all about loyalty. 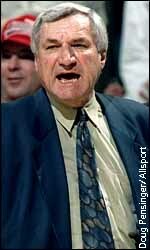 Just watching the Tar Heels play basketball through the years, it is easy to see why Dean Smith should be considered the top coach of all-time. Not only is he the most successful coach in winning games, he has also been (more importantly) the most successful coach in helping players reach their goals and graduate from college. Coach Smith innovated many of the aspects of the college game that people take for granted now: i.e. huddle at the foul line; the tired signal; and pointing at the player who just gave you an assist. Probably the best testament to his coaching ability is his former players' devotion and loyalty to Coach Smith and the University of North Carolina. Coach Smith exemplifies characteristics that are regrettably so lacking in today's society: decency; fair play; doing the right thing, not the easy thing. Coach Smith was the best teacher of the game of basketball, and he did it all with style, grace, modesty, and a sense of decorum. These attributes and his winning record definitely make Coach Smith (without a doubt) the top coach ever. Dean Smith went to every NCAA Tournament since they got rid of that ridiculous one-team-per-conference-even-for-the-ACC rule. He is the only one with that track record, which essentially means that he is the only coach whose worst year in 20-plus still resulted in a tourney bid. He was always in the top three of the consistently best conference. The streak he had of at least getting to the Sweet 16, all those Final Fours, and those five championship games. All this while losing more players early to the NBA than any other. But all this is nothing when you compare it to the fact that his program never got into trouble with the Draconian NCAA, his players graduated at an incredibly high rate -- even those who left early for the NBA -- and so many of them continue to consult him about their life decisions, including those who are or were at the top of their respective professions. 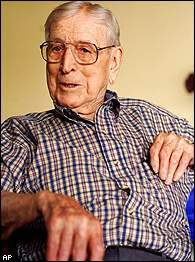 Even Mr. John Wooden said Smith was the best teacher of the game. He not only won a bunch of national championships, he did it over several decades. He changed with the times, first winning with quick small linemen, then with the big guys. He won with the wishbone, split backfield, and a pro set. He was a winner everywhere he coached. He always had a great defense. He also considered his responsibility to produce great men not just great ball players. He did a pretty good job of that as well. His legacy remains bigger than life in Alabama and a tour of the Bryant museum may bring a tear to any football fan. He won without superstars who most teams seem to require today. He won with athletes who were motivated by him to simply go out and do their best, both in football and life. He always gave them the credit for winning the games and he took the credit for losing them. He was a magnanimous benefactor to many charities and is considered a legend not only in this state, but across America. He embodied all that a great coach should be. Vince Lombardi's Packers dominated the NFL in the 1960s. The consummate champion. Instantly turned a franchise in terrible shape into a dynasty. And his whole life, he commanded the love and respect of all who knew him. As evidenced by all the times he is quoted even today, he is The Authority on winning. Vince Lombardi was the greatest coach of all-time, not only for his accomplishments on the field, but for impact outside the lines. I agree that the choice between Wooden and Lombardi is a tough one, but I think that one can safely say that Lombardi had much more of an impact outside his sport than Wooden. How often has a figure come along that transcends the sport in which he coaches to influence our culture? Lombardi was this type of personality. Lombardi represents an era in our culture that was golden and reverent. A time of great pride, and strife in our nation. In addition to having great national influence, let's not forget that the Packers of the '60s really gave birth to the NFL of today. Even today, the '60s teams are still used in promo films for the NFL. Wooden and Lombardi indelibly changed all of the players who played for them, but Lombardi's historic impact on the game and the nation remains with us to this day. It's real hard to take my coach over the great John Wooden, but I have to go with the guy who won so consistently on the pro level. Red built the NBA, creating a mystique that has yet to be rivaled in sports. Cold showers at the Garden, riding officials, the cigar -- the man knew how to get under an opponent's skin. He had only eight plays, perfected the fast break, created the sixth man, and began the greatest sports dynasty ever. No coach has led teams to more cups than Bowman (and his mentor, Toe Blake). What may be his greatest accomplishment, however, has been doing it over a period of time when professional sports, professional athletes, and especially the game of hockey have changed so dramatically. Scotty hasn't missed a beat. He's a throwback who has adjusted, while others -- in all sports -- have fallen victim to changing times. With all due respect to the Shulas and Lombardis, the Jacksons and Auerbachs, the Torres and Stengels, and the Woodens, Bryants, Summitts, and Paternos, Scotty Bowman has the championships, the longevity, and the adaptability. 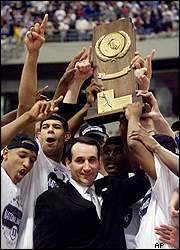 Duke's Mike Krzyzewski won his third national title this year. Anyone not choosing Mike Krzyzewski as the single greatest coach of all-time isn't paying attention. Even if you forget about the three national titles, all the ACC regular-season and tournament titles, even if you forget about the countless players he has guided to legendary college status (many of which without his guidance flopped in the NBA), even if you forget about how he won in spite of the fact that most thought it was a mistake to even hire him at Duke, you cannot mistake the fact that he loves his players. He cares about their schooling, and about them being model citizens. Coach K has always represented everything good about a game quickly going bad. He cares about running a clean program, and making his kids not only into tomorrow's NBA stars, but tomorrow's leaders. And while keeping his focus in the right place, Coach K still puts up the wins proving once and for all nice guys can finish first. Thank you Coach, you've done more for the game than you probably will ever realize. After he left the Bulls, he went to Los Angeles and won a championship with the Lakers. I would like to see any other coach try to win a championship with Kobe and Shaq, probably the two biggest babies in the NBA. Now he is about to win his second championship in a row with the Lakers. He did it with the Bulls and he is doing it again with the Lakers. That is why he is the best coach of all-time! 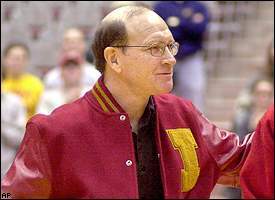 Iowa coach Dan Gable is an icon in the world of college wrestling. He combined a record of success and a history of greatness that was unmatched. Only Wooden and Auerbach matched Gable's string of success. But Gable became a greater icon in his sport than the other two. I don't think that anyone would argue that Gable is a greater icon in wrestling than even Lombardi is in football. Gable was a hero in his sport before being a coach. And as a coach he enhanced his stature. You almost never see that.